An unaltered photocopy of your DD-214 (post WW2), OR unaltered photocopy of WD AGO 53-55 (WW2), OR other military issued document clearly displaying your Drill Sergeant training, employment or qualification. I. DESCRIPTION: Metal: A gold plated metal and enamel insignia, 2 inches (5.08 cm) in width and 1 51/64 inches (4.56 cm) in height, consisting of a flaming torch above a breast plate and jupon in front of a rattlesnake on a green background, grasping in its mouth at upper right and with its tail at upper left, the ends of an encircling scroll inscribed "THIS WE'LL DEFEND" in black letters, between 13 black stars, 7 on the left and 6 on the right. EMBROIDERED: An embroidered insignia, as described above in subdued colors, except the size is 2 3/4 inches (6.99 cm) in width and 2 1/2 inches (6.35 cm) in height. The insignia is on an olive drab square background measuring 3 1/2 inches (8.89 cm) in width and height. II. SYMBOLISM: Some elements of the design are adapted from the United States Army Flag and the Seal of the Department of the Army (a snake, the motto and scroll and the armor). Also contained in the design is the torch of liberty and 13 stars. III. AWARD ELIGIBILITY: a. 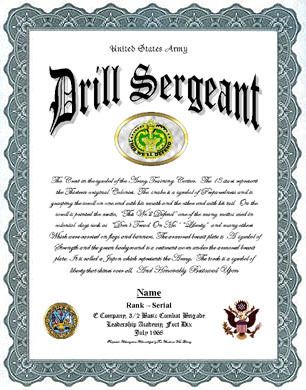 The Commandant of the Drill Sergeant course may award the badge upon successful completion of the Drill Sergeant course and assignment as a drill sergeant to a training command. The Commandant of the Drill Sergeant School will authorize the permanent wear of the badge to eligible personnel by memorandum. Officers are authorized to wear this badge if it was permanently awarded to them while in an enlisted status. b. The badge may be revoked if the recipient is removed from the position of a drill sergeant for cause, regardless of the amount of time the individual has served in the position in a satisfactory manner. Authority to revoke the badge is delegated to commanders of U.S. Army training centers and commandants of drill sergeant schools. Commanders of U.S. Army training centers may further delegate the revocation authority to commanders in the grade of colonel or higher who have the authority to remove soldiers from drill sergeant duties and withdraw skill qualification identifier (SQI) "X." IV. WEAR: This badge is authorized as a nonsubdued metal badge and as a subdued embroidered cloth badge. The nonsubdued metal badge will be worn on the right side as prescribed in AR 670-1. The subdued embroidered badge may only be worn on utility uniforms and field jackets with the badge centered on the right breast pocket between the bottom of the pocket flap and the bottom of the pocket or in a similar location on uniforms without pockets. When wearing both the subdued Drill Sergeant and Career Counselor Badges on utility uniforms, the Drill Sergeant Badge will be worn to the right of the Career Counselor Badge. V. BACKGROUND: The metal badge was first approved as the distinctive insignia for wear by trainer personnel assigned to U.S. Army Training Activities on 15 January 1958. The insignia for Trainer Personnel was authorized for wear by drill sergeants assigned to training commands in 1964. 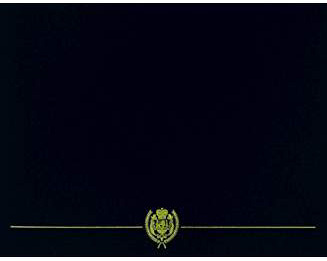 At this time, the insignia was authorized for wear in metal and embroidered form. The embroidered version was manufactured in full color (yellow, green and black) and subdued. In 1969, policy was changed and it was mandatory to wear subdued insignia on field clothing. At this time, the Drill Sergeant Identification Badge, embroidered, was no longer authorized for wear in full color.